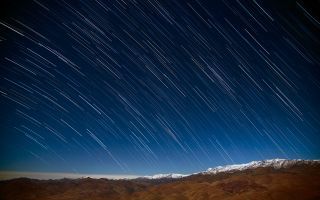 The stars appear to rain onto the surrounding mountains, as seen in this space wallpaper taken on 21 May 2013 by Diana Juncher in the Atacama Desert in Chile. The stars appear to rain onto the surrounding mountains, as seen in this space wallpaper taken on May 21, 2013 by Diana Juncher in the Atacama Desert in Chile. Star trail photographs like these are shot using a long exposure time in order to capture the apparent motion of the stars as the Earth rotates. A wisp of snow covers the distant mountain tops, and soft clouds can be seen below La Silla, near the horizon to the left. The slightly darker and redder area to the right is an open copper mine.